Big news! Freddie is semi-retiring! Now 14.5, Jimmydog’s Chief Canine Officer Freddie couldn’t be more excited about this new phase of her life. She’s got some big news and big plans! Dear fans, I’ve got a big announcement to make. As of this week, I’m semi-retired. But don’t worry, I’m not going to “live on a farm.” I feel great and that’s a big reason I’m cutting back on my many duties. I want to be able to enjoy myself to the fullest, and after many years of full-time work as chief canine officer at Jimmydog Pet Portraits, I’ve earned it. Of course, I can’t fully retire. Stephanie and Todd Belcher, the best people ever, have asked me to stay on at Jimmydog and I agree that no one else is equipped to do all my important work here. But we’ve decided that I can reduce my hours, as Stephanie and Todd take on some of my responsibilities. For instance, I’m teaching them how to alert everyone in the house and office to the arrival of the brown truck. Even after all these years of me warning them to the contrary, they still think the brown truck guy brings useful things to the house and should be welcomed. I’ve got to break them of that dangerous delusion. It’s important to stay mentally challenged so I’ll still write the occasional blog and, of course, I’ll continue to offer suggestions regarding the custom portraits that Todd paints. People say dogs are colorblind but I’ve always helped him settle on the perfect color palette for a new painting and I review all finished work as a quality control check. Over the years while watching TV with Stephanie and Todd, I’ve seen lots of commercials for places that promise people an “active retirement lifestyle” and I like the sound of that. I don’t golf, so I’ll be spending as much time as possible on long walks, car outings and boat rides. * Daily exercise. I attribute my longevity—and my attractive figure—to daily walks. Now that I’m older, I make some modifications, like walking earlier in the morning or later in the evening, but I still walk every day—rain, shine, snow or ice. Vary your routine to keep things interesting: I like to visit different parks in my area. * Regular vet visits. My people take me every few months for something called “senior wellness visits.” The visits are quick but still full of indignities: They weigh me, check my temperature (I can’t even bring myself to tell you how they do that!) and then draw blood with a big needle (I maintain a brave face but ouch!). To make it more palatable, I focus on the car ride there and back (always great fun!) and the walk Todd takes me on afterward for being such a good girl. (Remember: A positive mental attitude is important at any age.) Lately, Todd’s also been taking me to a place for cold laser therapy on my hips. I like that place better—no poking and prodding and it only takes a few minutes. Other dogs I know get massages or something called acupuncture. * Good nutrition, plus medication as needed. Our dietary needs change as we age and Stephanie does an excellent job of adjusting my diet to keep me feeling my best, whether that means adding a little slippery elm (whatever that is!) and yogurt to my dinner to keep my digestive track healthy or giving me anti-inflammatories for a touch of arthritis. * Adaptations. People seem to love hardwood floors but dogs, especially senior dogs, aren’t big fans. Stephanie and Todd have put down more rugs to keep me from sliding around in an undignified (and dangerous) manner, which I appreciate. You might need your people to get you a softer bed or buy a ramp for the car. My pal Clooney, also an older boy, asked his person to add a water bowl upstairs so he could avoid making so many trips down to the kitchen. His person also lowered her bed so he could get on and off more easily. Dog friends: Tell your people what you need. They’ll be happy to accommodate you. * Hobbies. As I mentioned above, I’m an avid hunter and a lifelong boater. Other dogs enjoy swimming or playing fetch. Having a hobby keeps you mentally and physically fit. Find something you love to do and it will keep you young at every age! Now, if you’ll excuse me. I have a walk to take. 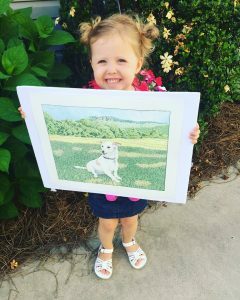 Thank you Chad Tucker for this lovely note and adorable photo of Carson Perry holding her Otis close to her heart once again. The appreciation you have for this portrait means more to us than we could ever express in words. We know Jimmy and Joey are taking good care of Otis at the bridge and you are correct, they are never far from you or have you out of their sight. “Todd, I’m at a lost of words. 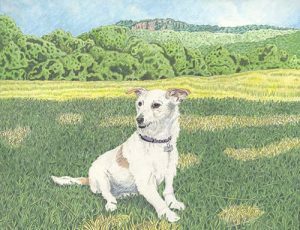 Thank you for the beautiful portrait of Otis. You are so talented! The detail is amazing. We received it yesterday and the many blessings it has already brought my family are beautiful. When I brought it home Carson Parry immediately said ‘my Otis.’ It brought smiles to her and happy tears to us. In her 3 year old comprehension she thinks dog heaven is right around the corner and Otis isn’t that far away. Your gift reminded us that Otis really isn’t that far and that people with big hearts still care. We have the perfect place for the portrait and are so looking forward to having it framed. We’d love to meet you one day soon to say thank you in person. For now, thank you for sharing your talent and loving on my family. We’ve been long time fans of Chad Tucker of our local MyFox8 news. 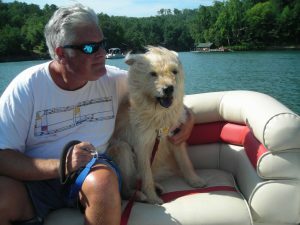 He’s a great reporter and last year we found out what a huge animal lover he is and that there was one very special dog in his life named Otis.We read on Facebook about Otis and the impact he had on his life, and we were heartbroken as he recounted last June that final, beautiful weekend with him. What a life Chad and his family gave Otis and what powerful gifts he gave them in return. The stories and photos Chad shared of Otis, inspired Todd to paint this portrait and send it as a surprise to Chad and his family. On this the first anniversary of Otis’s journey to the bridge, we celebrate his life and the love he shared with his family. Sweet Audrey thinks every day is Tongue Out Tuesday! 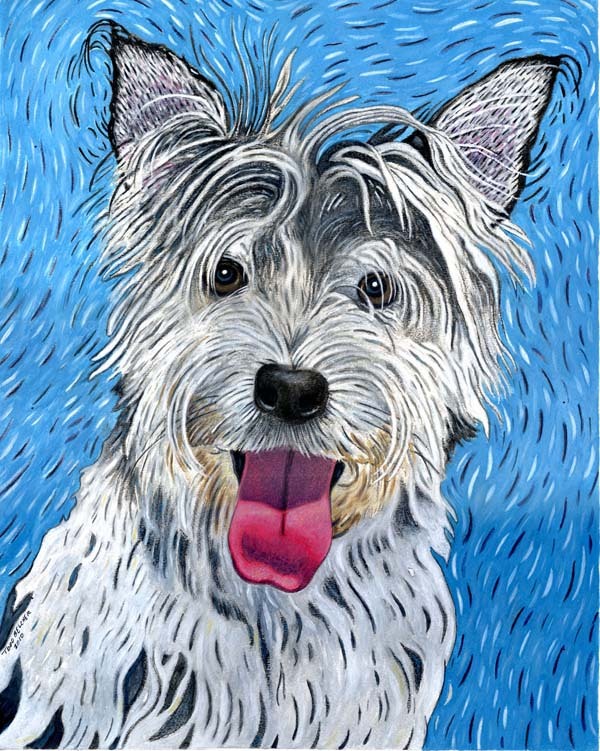 This happy pup is Archie, one of Todd’s first pet portraits after opening Jimmydog Design Group. The recipients were so happy with their painting, the next year they commissioned 3 more portraits of Archie making him one of Todd’s most painted subjects.